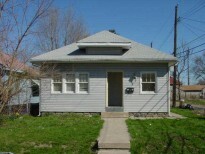 View - 3114 W 9th St.
2 bedroom 1 bath bungalow on west side of Indy. Home features dining room, enclosed porch and one car garage. Home is close to bus line and convenient to downtown.